I literally laughed out loud when I saw this, and then got the stink eye from both of my cats. Your cats obviously have superior taste and great wisdom. A beautiful work with a splendid, naive charm. Why thank you A. Narchist. And may I compliment you on your fabulous name? It is a handsome likeness, although a bit scraggly. As I recall your fur is nappy and smooth like an old rug (in a good way). Like an old rug? Like an OLD RUG??? "Good way" or no, Spinning Girl, you wound me! I've been told I am a very VERY good artist, BY MONKEY! 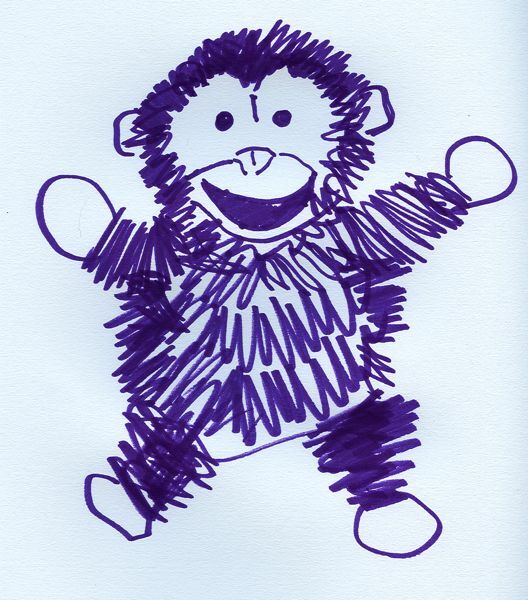 i will ilillustrate your book monkey.